I must have been about thirteen when I first saw Night of the Living Dead. I watched it with about ten other people in the middle of the hottest day of summer on a murky videotape. In fact, I actually started viewing the movie about twenty minutes in. But even then, Night of the Living Dead created a feeling of nauseating dread that has lingered through me still today. The story of Night of the Dead is well known, especially since it provides the plot arch of any zombie movies. A space probe blown up in Earth’s atmosphere sprays radiation across the east coast of America, causing the dead to rise from the grave and feast on the flesh of the living. In a small farmhouse in the middle of Pennsylvania, a group of survivors try to fend off the reanimated corpses attempting to eat their bodies. The group includes Ben (Duane Jones), an African-American man who plays the sturdy leader, Barbara (Judith O’Dea), a young woman who visited her father’s grave just before the zombies attack, Harry and Helen Cooper (Karl Hardman and Marilyn Eastman), a couple whose daughter Karen (Kyra Schon) has been bitten, and teenagers Tom (Keith Wayne) and Judy (Judith Ridley). All of them are desperate for survival and attempt to find away to escape the farmhouse, which soon becomes surrounded by the undead, while trying to find a capable way of defending themselves. Night of the Living Dead never directly scared when I first saw it, mostly due to the cheap special effects, which makes some of the film’s gorier scenes amusing and a bit unintentionally funny. However, after the movie ended, I couldn’t help but be frightened of what I just witnessed. 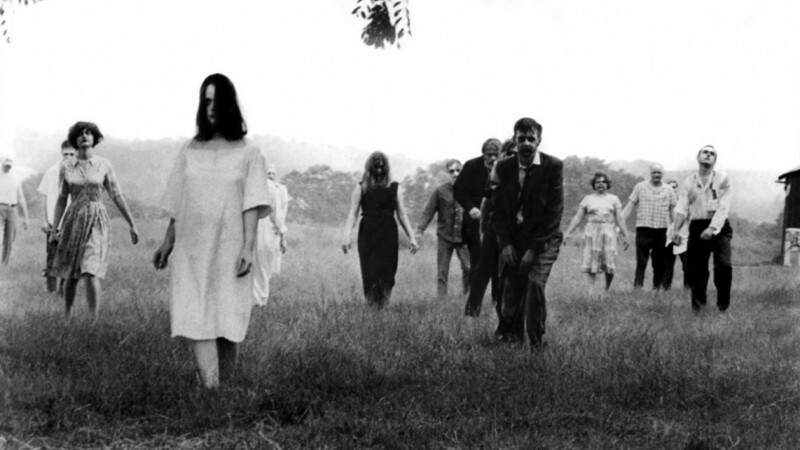 The idea of the dead coming back to life is terrifying enough, but the true horror of Night of the Living Dead comes from its living characters. There are hints of racial tension in the picture, something which I’m not sure if director George Romero intended or not, through the character of Ben. Night of the Living Dead may not have arrived at a more time, coming a few months after the assassination of Martin Luther King Jr., as the ending (spoiler’s alert) clearly echoes the event. Not only that, but Night of the Living Dead also tackles themes of cannibalism, the Cold War, and morality itself. The situation of Night of the Living Dead has rendered the movie to be incredibly believable, which is why I suspect it’s aged very well. It may not be in the same league as other horror movies such as The Shining or Psycho, but Night of the Living Dead’s ability to horrify still remains even after forty-five years. « What Do You Think About 3-D? I actually like Night better than Psycho and considerably better than The Shining. In fact let me just say it: it’s my favorite film of all time. I LOVE IT. Genuinely creepy. Brilliantly directed. And all done with a very small budget and several big hurdles to overcome. What a fabulous movie and I loved reading your review. Anytime this movie is given props I get excited. Thanks! It’s a great movie for sure and one of the best horror movies I’ve seen. It’s really effectively made with a tiny budget. Thanks! I agree, incredibly creepy that surpasses most horror movies today. This is the one film that got me into horror. Absolutely brilliant. Great write up! Thanks! One of my favorite horror films. Indeed! Watch this one alone and at night, it will definitely creep you out. Still a brilliant, breakthrough film for George Romero. The echoes of which are still reverberating to this day. Timely, wonderful write-up, ckckred. Thanks! I saw it again a few weeks ago and the ending still runs chills down my spine. You’ve definitely got to see it. It’s in public domain, so you can watch it online for free. Yeah, just about every other zombie movie has the same plot, and few can compare to Night. Man, I’ve still not seen this, which is a bit embarrassing to be honest. I think this month’s the perfect time to put that right! Thanks! It’s available on public domain so you can find it online. One of the best horror movies ever made, and it’s incredibly suspenseful. I think I was about the same age when I first checked this one one out on VHS. Pretty sure the racial tension was on purpose it was the 60’s after all. Even more crazy is that they made this for about a hundred grand. Thanks for the comment. Yeah, it’s amazing what Romero achieved on such a small budget. Great film. Great review, this is so effective considering the small budget it had. Thanks! Romero certainly accomplished a lot with his budget.